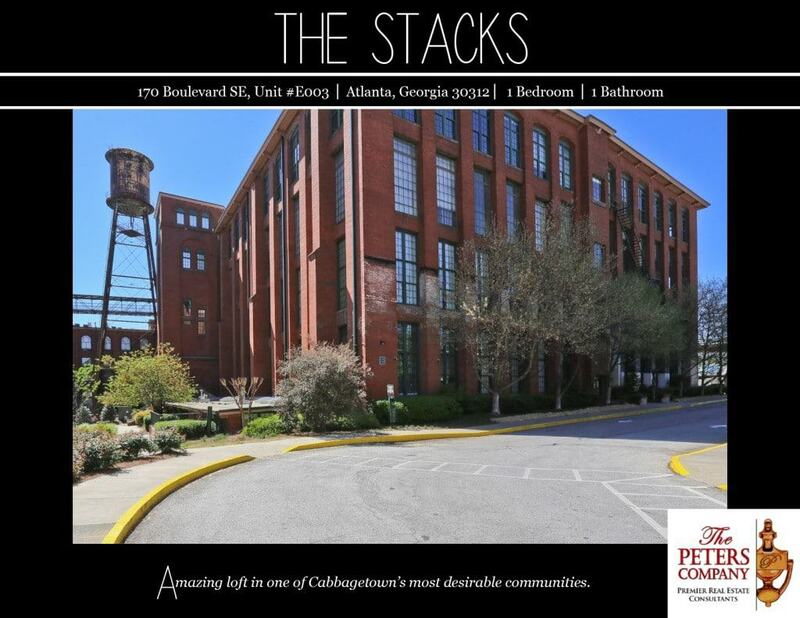 Just Listed :: Amazing Loft at The Stacks! Welcome home! Historic charm meets modern day luxury in this true loft, giving you an amazing intown Atlanta experience. The wide open, renovated floor plan is just what you’ve been looking for. Easy access to Dekalb Avenue, Freedom Parkway, I-85, and I-20 makes virtually all commutes a breeze. Convenient to all of Atlanta’s finest attractions, you will be in the middle of it all including prestigious shopping, award-winning restaurants, and exciting nightlife. You’ll also be only minutes from the Beltline, Ponce City Market, Krog Street Market, Grant Park, Inman Park, and much more! · Exposed brick walls, concrete floors, and a wood beam ceiling are wonderful architectural details carried throughout. · An updated kitchen features stainless steel appliances, granite countertops, and sleek glass tile backsplash. · Separate dining area is perfect for entertaining guests or casual meals at home. · Living room is bright and open with tons of natural light pouring in from a series of tall windows. · The bedroom space is well-sized and includes a great office area with built-in speakers and MP3 docking station. · The large bathroom features modern fixtures and has access to a spacious walk-in closet. · Laundry is conveniently located in the unit and provides additional storage space. · Wonderful community amenities include gated access, a well-maintained pool, gym, and rooftop terrace with stunning city skyline views. ← Just Listed :: Beautiful Traditional in Jefferson Station!